If you’ve used a sewing machine before, you understand how important it is to have the right type of table to hold your machine, accessories, and projects. Between countless spools of thread, seemingly endless yards of fabric, and the sewing machine itself, organization is key to completing projects efficiently. 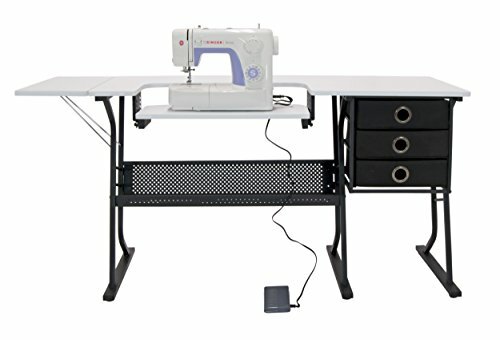 A sewing table can not only house all of your sewing gear, but also provide a large surface for you to comfortably work and sew. Don't want to read the whole review? Here's the quick summary. Sewing tables are one of the best quality of life upgrades you can make. Once you get one you'll never know how you survived without one. We recommend the Sauder Sewing Craft Cart which has everything you could ask for in a sewing table. Check out our full review below. A sewing table is a table or desk that is designed to be used as a workspace for machine sewing. These tables have larger surface areas and more storage than your average table to make them ideal for sewing. Sewing tables vary greatly in construction, storage space, and visual design. Some options can be disguised as living room furniture while not in use; others include adjustable shelves and surfaces. The key to finding the perfect sewing table for you is deciding which features to make a priority. Are you looking for as much storage as possible? Is stability the most important factor in determining the quality of a table? A sewing table should provide enough storage, workspace, and durability to handle the sewing projects you want to complete. Large amount of surface space: Having the room to spread out will make all the difference when you’re sewing. Whether you’re cutting fabric, pinning pieces of a project, or sewing large sections of material, a large surface space will make your life easier. Several cabinets and drawers: Storage is important for a top-quality sewing table. Having your tools, materials, and unfinished projects organized and within reach is the most efficient way to work. Durable surface: Since you’ll be working with needles, scissors, and other tools, you want your sewing table to have a durable surface. Look for a sturdy tabletop that’s resistant to scratches, heat, and stains. Adjustability: Sewing projects often include several steps that may benefit from different table setups. 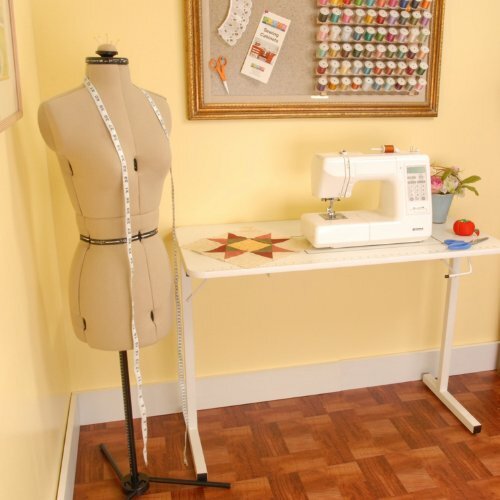 Adjustable legs and shelves are both excellent features to look for in a sewing table. Strength and stability: It goes without saying that your sewing machine should be strong enough to support the weight of your sewing machine. But it’s also important for the table to be highly stable so that it won’t sway with the vibration of the machine while it’s in use. Portability: Not everyone wants their sewing table to be a permanent piece of furniture. Look for a lightweight table or a table on wheels if you want the option to place it in different locations. Many sewing tables can be folded for greater portability and storage. Is a folding sewing table right for you? Read more about this type of product below. These tables can be collapsed and stored when you’re not sewing. This is great for those of us who are tight on space or don’t sew on a regular basis. Folding tables tend to weigh less than non-folding options, making them easier to move and reposition. Folding sewing tables are often more affordable than non-folding tables, making them a great option for sewers on a budget. Folding tables are not as stable as non-folding options and may be more affected by the movement of the machine while in use. Folding sewing tables generally don’t have very much storage for tools, accessories, and projects. Due to their lightweight construction, folding tables typically aren’t as durable as other available tables. You have a lot of options when shopping for the perfect sewing table, and it can be hard to know which product will best suit your needs. The three sewing tables listed below are all excellent options for you to consider during your search. 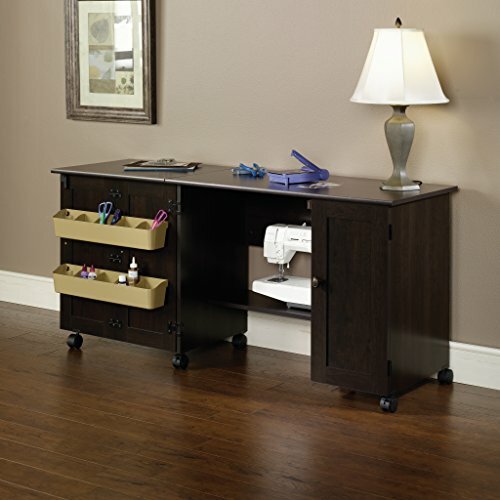 With your a sleek cinnamon cherry finish and trendy metal pulls, the Sauder Sewing Craft Cart is one good-looking table. It has a space-saving design with roll-open doors that cover storage bins and shelves. So, when you’re not sewing, this cart just looks like a beautiful set of cabinets. This sewing cart has plenty of storage that can be concealed behind the cabinet door while not in use. Behind the door there are two storage bins, two adjustable shelves, and one hidden shelf to house the sewing machine. This cart is both attractive and functional; the tabletop is made of heat, scratch, and stain-resistant melamine. The built-in drop leaf adds a significant amount of workspace for long sections of fabric and complex projects. With its cart construction, this product from Sauder is on wheels for exceptional portability. The cart doesn’t come pre-assembled and the process of putting it together at home may be confusing for many. While the built-in wheels make this sewing cart portable, they also compromise its stability. The tabletop of this cart is relatively low and taller individuals make struggle to find a comfortable position. The height is not adjustable. The Studio Designs 13362 sewing table is an affordable product with a modern look and innovative design features. It includes an expansive main top, a drop down platform, three storage drawers, and a lower storage shelf. 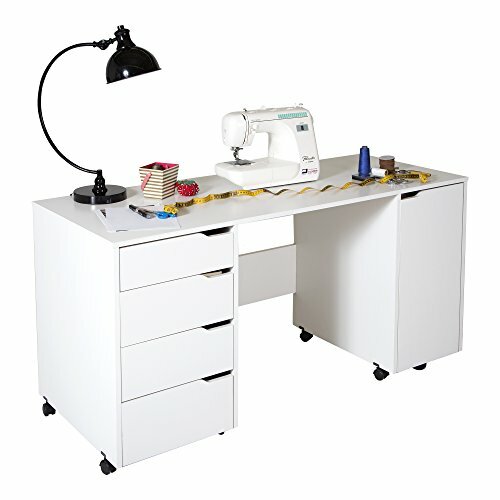 The drop down platform can be adjusted to hold your specific sewing machine, up to 25 pounds. This sewing table has six floor levelers to help keep the table level on uneven surfaces. It also has a gauge steel frame and ⅝” thick tabletop for added durability. The main top surface measures 50.75” x 23.75” and has a folding side shelf measuring 9.5” x 23.75”, making for an expansive workspace to accommodate extra-large projects. The platform shelf is easily adjustable to fit your machine perfectly, no matter what its base height is. With just three small side drawers, this table’s storage is limited compared to other similar products. The small side drawers are constructed of fabric, making them somewhat flimsy and unable to hold very much weight. When your sewing machine is running at full force, the table may vibrate and bounce. 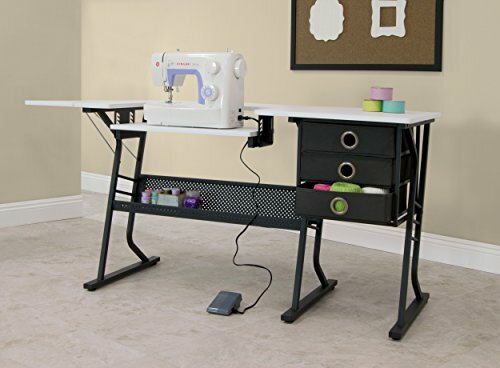 A clean, streamlined design, plenty of storage, and built-in wheels make the South Shore Crea Sewing Craft Table a fantastic product. Plus, the all-white, non-toxic laminated finish will blend perfectly with just about any home decor. This sewing table has been cleverly designed for optimum storage. On the left side, there are three large drawers and one sliding shelf with built-in, removable dowels for conveniently storing spools of thread. On the right side, there’s a slide-out storage module with two shelves, (the bottom shelf is perfect for storing your sewing machine while it’s not in use). The tabletop is water resistant and scratch-proof to handle even your most demanding projects. All of the drawers are on metal sliders and feature cut-out handles prevent any snags on your fabric. This wheeled table features casters with built-in stops for both stability and portability. This cart is quite heavy and requires two adults for assembly, but the tools needed for assembly aren’t included. Some of the panels aren’t laminated on both sides. This sewing table weighs 135 pounds, so it may be quite difficult to move over carpeted areas. With the perfect sewing table, you’ll be well on your way to being the productive and creative sewer you’ve always dreamed of being. Just think how much more organized you’ll be with the storage and work space to accommodate all of your sewing needs!